We’re tucked away at an RV park in Albuquerque. I can feel the shadow of Jesse Pickham and Walter White all around me. I stopped at the check-in desk and asked where I could get a local newspaper. She gave me directions. I’ll bet you get a lot of questions about “Breaking Bad” from the tourists, I said. Mostly foreigners, she said. Americans don’t seem to care too much. Any nearby places that were made famous, like the car wash? I asked. I wouldn’t know, she said. I didn’t watch the show. People here say the show will make or break this city. Moments later, I passed by a prostitute closing a deal with a guy with a white beard (wasn’t me). I went to the store to get the paper and a woman pushed ahead of me in the check-out line. She had the body type of Calista Flockhart on an uncontrolled diet. She didn’t even say sorry. I looked at her well-worn face. She may have had a molar somewhere inside her mouth…but I wasn’t going to look. Ever since Kingman, Arizona, our route, I-40, wove back and forth along the historic Route 66. I decided we should drive along a stretch of the classic old highway of Americana that went roughly from Chicago to Southern California. Most of it is gone. It turned into I-40, or was simply torn up and forgotten (by some). I even ran across several sets of Burma-Shave signs. The part we were on was the actual stretch of the historic road. I know that because the signs said “Historic Route 66” at several exits. The route is not much more than a service road for I-40 for most of the distance. But if you’ve followed these stories I’ve done the trip, I wanted to see the “real” USA, and not from an Interstate. So, you get off onto a “historic” road and are immediately confronted (smothered, really) by the “nostalgia” shops. These places were filled with Coke signage, Harley plates, James Dean mugs and American flags. Even refrigerator magnets! I mean, really. What would the hobos of old think of buying a refrigerator magnet with Route 66 on it? They could barely afford a cuppa joe. I stood looking at the assortment of post cards and key chains…all devoted to a bygone era. I sped past these places and where it was safe, I stopped and photographed the ghosts. Then we arrived in Holbrook, Arizona. Yes, the check-in guy said, there’s some old places if you take a right on Yuma Drive. So we did take that right. And in about a mile, there it was. 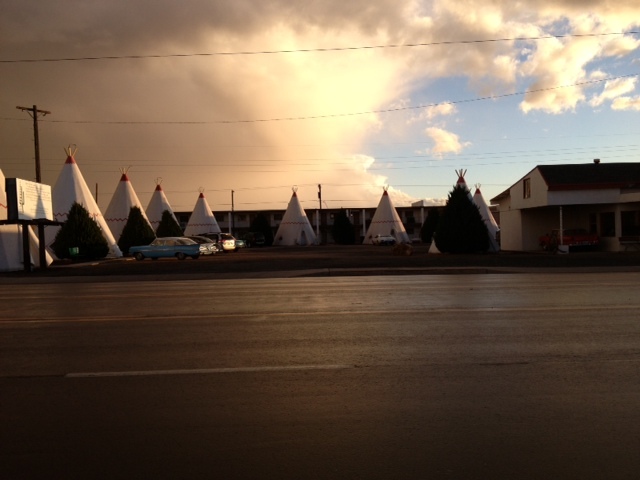 The famous, Wigwam Motel. There were vintage cars parked in front of the units that were actually constructed like wigwams, and you could rent one for the night. Now that’s traveling in class. But, it’s been a long trip and home is still over 1500 miles away. It’s time to end this adventure soon, perhaps in about ten more days of driving. Don’t laugh, you can only go so fast pulling a ton and a half of stuff. Yes, I’d like to get home. I can’t wait to attach my Route 66 magnet to my refrigerator. Well, sir, he’s out of our jurisdiction now. We monitored his situation carefully and kept him under close watch. As you know, we had choppers in the air and “unmarks” following him in black vans that had those cool smoked glass windows, and thanks for that, by the way. Funny thing about the old guy…most of us started taking a liking to him. I mean he is something of a freeloader, the way he goes into a MacDonald’s and buys a coffee. But never has anything to eat except those two times he had a chicken salad. He only goes there to use their free Wi-Fi to post those nutty blogs about his trip. But, there was something about the guy we began to admire. Like the way he would slow down in these desert towns to let other RV’s make a turn…or to let an old lady cross the street. Our hidden mikes picked him up, on these occasions mumbling something about getting indulgences from someone in Rome to make his stay in Purgatory quicker and less painful. He’s so sure he’s going there, wherever that is. Isn’t Purgatory in Texas or something? Anyway, we got him safely to the Observation area on the South Rim, even though he did his best to throw off our tail by pretending to get lost trying to find the RV Park. I mean, can’t the guy read a map? Or does he rely on MapQuest? Our agents stayed clear as we let his wife take him around the National Park Visitor Center. He got his little passport stamped and then headed for the bookstore. It was like he was delaying his approach to the viewing area. Like he was avoiding it for some reason. We thought he was afraid of heights or something but, little by little, his wife led him toward the Rim. He began to slow down and started to limp, favoring his right leg. Agents overheard him complaining about the pain in his shin and his lower back. We only found out later that he is due to get his back operated on in New York City in November. So, he took the arm of his wife and limped toward the fence at the Rim. He kept his head lowered and didn’t try to sneak a peak at the view. This is when a few of the guys started taking bets on whether or not he’d make it to the very edge and look in. I lost a sawbuck, and Barky, the agent that everyone says looks like a Pug, lost a finback. Elvis, the agent with the sideburns, put in ten slugs thinking he’d fool us into thinking they were quarters. Doesn’t matter, he lost the slugs to the Pug, Barky. Mariah, the only woman agent we could get our hands on, stopped off at the women’s rest room to fix her lipstick. We saw her last, walking off with the Dr. Pepper deliveryman. She always liked men in uniforms. Oh, yeah, the old gray bearded guy: well he got to the top rock of the steps leading down to the Mather Vista. He was clearly in pain. Then the craziest thing happened. He stopped cold and opened his eyes. His wife looked up at his face. I, myself, saw tears rolling down his cheeks. The man was crying. He probably felt glad he had his expensive sunglasses on. That way all the German and Japanese tourists wouldn’t see him sob. His wife hugged him, probably thinking that his leg pain was getting worse. But, it wasn’t the leg at all. He stepped to the railing and stood looking out and then down. He took his iPhone out and snapped a picture and immediately texted it to his son in New York City. He sat down on a flat rock and put his phone down. I glanced at his text message and it read. “Finally! And after a lifetime of wanting to see this”. He got up and walked back to the railing. I stood next to his wife. I pretended to be interested in the view. I wondered what had moved him so much about a big gulch and a bunch of rocks. He wasn’t saying anything but I began to pick up on some strange vibes he was emitting. I felt that he was moved by the grandeur of the view. This was nearly a religious experience to him. What he was trying to take in was too much for his brain. He was showing signs of sensory overload. Trust me, sir; I’ve seen that look before…like when we had to keep tabs on a trucker while he sat looking at the pole-dancers at the Boom Boom Room. It’s more than they can take in. This was definitely more than the old gray haired guy could handle. He left, wiping his cheeks. I heard him mutter something about never having seen anything like this before…and probably never will. So, as I said, he’s out of our area now. He’s seen it. 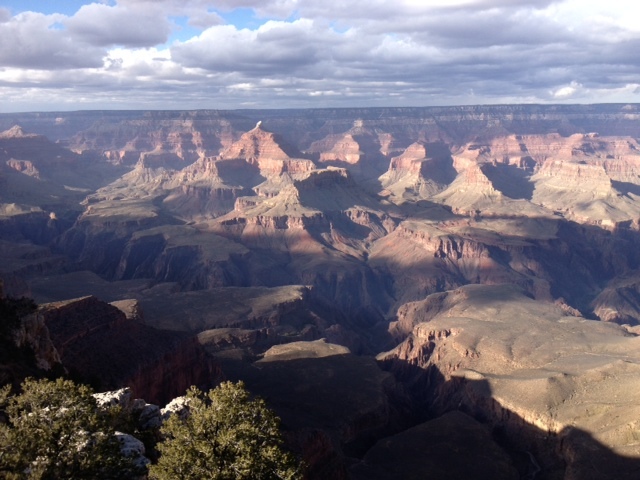 There is no one else on our list who hasn’t’ seen the Grand Canyon. No one is left. Wait a minute, we just ran a Google search on his son. He hasn’t seen it yet, either. Wonder how long he’ll take. Hope it’s not “like father like son”. The kid has to see it soon before Microsoft buys the place. After it was closed a few weeks ago due to the shut down, there was talk of leasing it to private concerns. It was a Republican plan. You know save money. After all, someone in Washington said, who cares about these things anymore anyway? An amazing discovery has been made here in northern Arizona by Federal, Local and International Agencies. As unbelievable as it seems, these officials (speaking only on condition of anonymity) have located the last American citizen who has never seen the Grand Canyon. It is believed that his wife is traveling with him and has been known to make similar claims about never having been to the most famous American Landmark in the world. “We got onto his tail when one of our tech guys was listening in on the Internet for hackers. Then we ran across this goofy series of blogs this guy was posting. We secretly attached a GPS device on the fender of his tiny RV…I mean, good lord, the thing is no bigger than a few phone booths tied together. Anyway, we tracked his movements after a long time spent in a place called Orting, WA. He was there to visit his grandson. After his alleged visit was over we interviewed his daughter. “Well, there must be some mistake,” she said. “Elias’ grandfather ran away with a stripper from Mexicali back in ’79”. 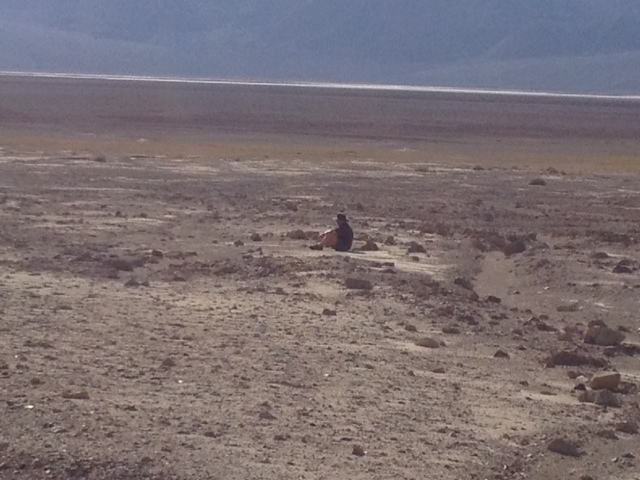 Travels 18: The Call of the Desert: or If I Can’t Stand the Heat, What Am I Doing in Death Valley? A man who refuses to acknowledge his god is unwise to set foot in the desert. I think it’s the isolation that attracts me to the austere places on the planet. I love the North because of the intense bone-crystalizing cold. The water-logged plants and animals without name or end that populate the Rain Forest astound me. The endless sea, sky and water separated by a sometimes imaginary line, frightens me yet holds me firm to the experience. The soaring heights of the Great Mountains of the World, where you could fall from a broken piton and drop for hours and your oxygen starved brain can kill you in mid sentence, thrill me. These places will slap you hard on the face and make you pay attention to the tenuous nature of life itself. But, the desert! The desert is somehow unique. I believe that the very nature of the emptiness of these places gives a hint that this is the world of gods. The major religions all had their start in the desert. Jesus went into the desert to fast for thirty days. The native populations of the deserts of the world have a complex nature unlike other societies (feel free to argue the point). Very few places allow you to be so utterly alone with your own soul and heart and brain. You can talk to yourself without feeling crazy. So, here I am. Camped in a place called Furnace Creek. Which, by the way is -190′ below sea level. Nearby is the Queer Mountain Wilderness Area. That would be just a little to the north of the Funeral Mountains. Just to the south are the Black Mountains. 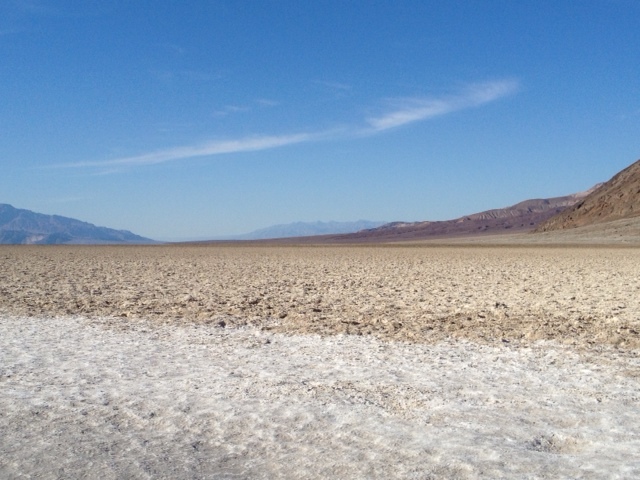 These surround Badwater Basin. Just off Badwater Basin is Coffin Creek. And overlooking the Basin is Dante’s View. The entire National Park is dotted with ghost towns. Places like Greenwater and Skidoo. Towns that boasted opera houses, banks, hotels, saloons beyond count and of course, brothels. Houses of ill repute run by the likes of tough-as-bark madams. Does anyone not have the imagination to picture Diamond Tooth Lil getting off the stage-coach and wandering into the local saloon to drink with the men! Oh, dear me! I wanted to experience the heat and the emptiness yesterday, so I parked the car and left my wife with the AC running. I walked 100 paces into the desert and sat. I pulled out my pocket thermometer. It read 96 degrees! Maybe that was my pocket temperature, who knows? (But I’m not that hot of a stud). The ground I sat on felt like it never felt a drop of rain. I closed my eyes. I saw visions of lonely miners wandering off to their death. I saw crowds of people, laden with their belongings moving as one toward the west. They were leaving someplace. I wondered if there was a Lady Antebellum concert nearby they were avoiding. But, I knew they were seeking the gold fields of the Sierra Nevada Mountains. In my mind, I felt like getting up and following them. I opened my eyes and I got up. It was too bloody hot out there. I could see my flesh turn brown before my eyes. My expensive sunglasses did nothing to dim the glare of the scorching and blinding sun. The sky was as blue as any I’ve ever seen. But it was back to the car for me. Did I have a mystical experience out there? I don’t know. I’ll have to think about it while I sip an icy tonic water back at the ’49er Cafe. Acrophobia (n). An abnormal fear of high places. Did you ever sit in the driver’s seat of your car with a lovely woman beside you? You are resting your right arm on the beige vinyl coated foam armrest. You fingers can touch the shifting lever. She is resting her left hand on your forearm. This was just like sitting in the Drive-In movie and you’re watching “Creature of the Black Lagoon”. It’s about 1955. Suddenly, her hand tightens its grip on your flesh. The Creature is swimming perilously close to the pretty leading lady. The hand on your arm is getting tighter now. It’s beginning to hurt. Have you ever sat like this and then glanced down to see her fingernails begin to pierce your skin? Have you ever done this and then realize you’re not at a 1950’s Drive-In, but on a mountain pass in the Sierra Nevada’s? And the Creature is not an amphibious monster…no, the fear is the sheer drop off on the right side of the car. Have you ever done any of this? We had just left a strange little ghost town called Chinese Camp, on the western slopes of the Sierras. 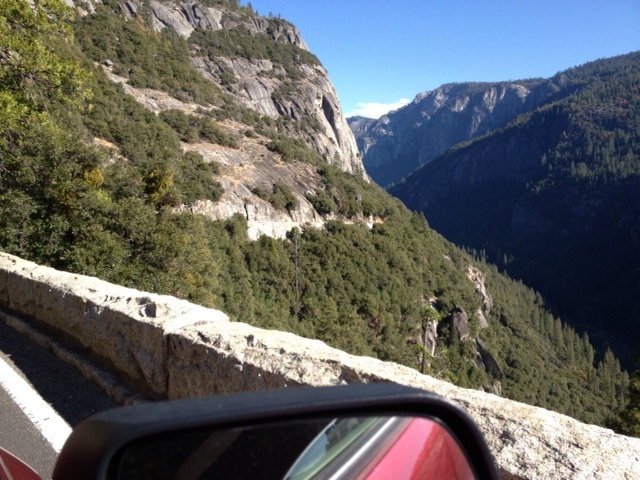 We began our slow climb up the road that would take us to Yosemite National Park. At first, the views were mostly of small valleys with signs of a recent forest fire. Then, as we climbed, my wife’s vertigo began to set in. It started with the tightened grip on my right forearm. As we climbed toward the Pass, the road edges were giving away to slopes that looked as though you would need a climbing rope if you ventured only a few feet from the nearly nonexistent guard rails. Guard rails? What a joke? These plates of metal would work well in a parking lot. By now our small R-Pod felt like the size of the Queen Mary and the two lane roadway was fast becoming nothing but a grazing path. My wife begged me to drive slow. But I didn’t know how to go slower…we were already doing about 17 mph. My wife begged me not to tease her. So I didn’t. I didn’t ridicule her fear. What right did I have to do that? I had fears also. But most of my fears involved being incarcerated and having a 425 lb. guy named Blaster follow me into the shower. My wife was nearly off her seat now. She was looking into my right ear lobe. I was straddling the yellow line in the road. She began making small squeaking sounds followed by very deep moans. I thought she might be having a major cardiac event. I snuck a glance at her expression. Her lovely features were contorted now and she was making faces that looked like she was in a doctor’s office have a colonoscopy performed by a demented doctor using instruments designed for difficult Bison births. Around this time, her fear started to become my fear. I had this feeling that a huge magnet was pulling our car toward the edge…and then over. The heights made my head swim and I became dizzy. Lack of oxygen, I told myself. But the sides of the slopes beyond those missing guard rails were steep and deep; ever so deep. I had the distinct feeling that if we went over, we would fall all the way to the bottom of Dante’s Hell. I swear, I looked out of the right window and saw mountaineers who were sitting on the summit of Everest, wave up at us. I saw the rafters at the bottom of the Grand Canyon wave up at us…shout a warning that our wheels were hanging over the lip of the South Rim. After endless hours and miles, we were over the Pass. Then we started down the other side. Funny, but I always thought that the Eastern slopes of mountain ranges were gentler than the Western slopes. Guess not. We reached the valley bottom and found a camp site near a town called Lee Vining. Who was this Lee Vining? I checked the condition of my right forearm. I was comfortable knowing that the scars would heal by the time we got home. The beige armrest wasn’t going to be so lucky. My wife’s fingerprints and nail holes were there for good, I’m afraid. I wonder if Lee Vining’s wife had such sharp fingernails. I’ll have to Google him and find out. One long-standing rule of life I generally live by is not to form serious long-term relationships with people you meet at highway rest stops. Today, I made an exception to this tenet and I bonded with an older guy named Rex and the girl, Jenny, who sat at his feet. We had been ripping down I-5 in Central California at a tire-melting speed of 54 mph. I swear the paint was about to peel off the leading edge of our camper as we flew along. Grove after grove of Olive trees sped passed us. Each of these plantations were manicured like a vineyard in Provence. At one point, we passed an articulated open truck carrying a ton of garlic heads. Now this was the land Pete Seeger, Woody Guthrie and John Steinbeck wrote and sang about. Every few miles was a sign that reminded us that “Farmers Feed America”. This is what Willie Nelson is trying to save with his Farm-Aid concerts. I felt like pulling over, climbing the barbed-wire fence and running through the Olive trees singing Nessun Dorma…reaching the high C until the mile long diagonal row of trees ended in an irrigation ditch. Yes, this I would do to demonstrate my love for this land to anyone within the range of my voice. Only two things prevented me from doing this wild and crazy thing: I really can’t sing (much less reach a high C) and I had to urinate like Secretariat. We pulled into the next Rest Area. My wife stayed in the car and I meandered (with haste) to the men’s room. I exited by the rear door and walked back to the fence to look at an Olive Grove from a better angle. It was on the way back to the car that I heard the singing. There were no other travelers there save for two guys who were sleeping on the picnic tables. There were two maintenance workers wearing day-glo green/yellow vests. I changed direction and walked through the breeze-way between the men’s and women’s units. In the center was a bench. It was occupied by an older gentleman playing a guitar. His carrying case was to his right. There was a plastic cut-off milk carton just to his left that contained several dollar bills. A crude music stand, a reject, perhaps, from a defunct junior high school music program or a hand-me-down from an ancient bluesman. He was singing “The Yellow Rose of Texas”. At his feet, was a small dog wearing a short lease that was tied to nothing. I stuffed two dollars into the container. When he stopped singing, he began to talk to me like he had not spoken to anyone in weeks. He told me how important country music was to him. Not the new stuff, no sir, but the old, the pure songs that came from the heart. He played “Your Cheatin’ Heart” and his ancient voice bent around the lyrics like a narrow roadway up to the summit of Mount Heartache. He said that was Hank Williams…I said I certainly knew that. Then he said I can’t really sing this but I’ll give it a try. It was sad to hear him struggle with the yodel of “Honky Tonk Blues”. By this time I had motioned to my wife to come over from the car and hear him. He told us how he was setting up one afternoon at a Rest Stop to the south and in the space of ten seconds, he said, someone opened his car and stole five of his song books…books with lyrics, scores and his own notations. Why would someone steal his song books, he asked? Just as he was starting another story, I put another dollar in his bucket. I said we had to move on. What was his name: I asked. Rex, he said. We turned and left Rex and Jenny at the Rest Stop. He was starting to tell the story of the stolen books to another man who had wandered up. 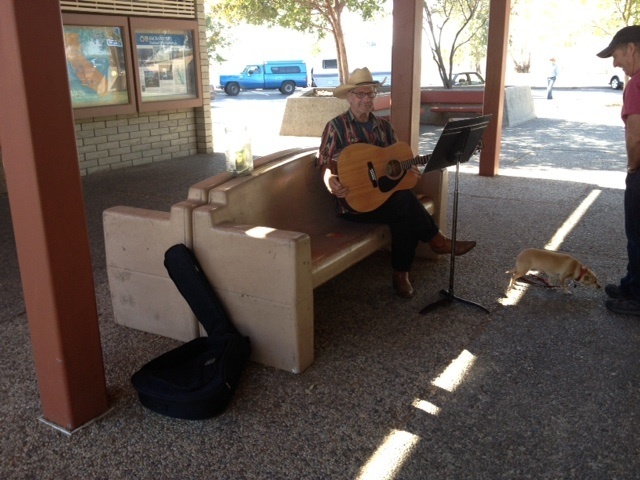 Rex will probably never remember me, a guy named Pat who stood and listened to him sing at the Rest Stop. Me, who can’t sing or play the guitar…but knows an old and pure song when I hear it. This morning I was very chilly in Oregon. It was about 41 degrees. Then we crossed into California and when we parked the R-Pod, it was about 87. Right now (it’s almost 9 PM), I’m chilly again. I wish someone would develop a reversible shirt. I could put it on when I’m chilly and then, later, when I’m warm, I could just turn it inside out. This is a state of memories. When I was a kid growing up in Owego, NY, I knew that the Triple-R Ranch, where Spin and Marty would spend the summer, was out here somewhere. Downstate, on a back lot, Rick said “Of all the gin joints…” and Rhett said, “Frankly, my dear, I don’t give a damn.” Cowboys and Indians rode all over this state. Out here, the Lone Ranger said “Hi, Ho, Silver.” A young girl from any town USA would come here, be a waitress…and before you could say “Directors Couch”, she would be walking across the red carpet. Somewhere out in the San Fernando Valley, the headquarters of “grown-up movies”, (I’ve been told) some pretty girl named Alice from Alabama is saying “Oh, Oh, Yes!”. Or a good-looking hunk from Florida is saying “Oh, Oh, Yes!”. It’s an amazing state. It’s startling to realize that nearly every 50’s TV show or movie was filmed here. In a way, the California culture defines the American culture. One thing I find a little odd, though, is that there are a great many people here who have lives of their own and, hold on to your derby, haven’t paid me the slightest bit of attention. The exception is the guy at the state line that checked our trailer for gypsy moths. In the hours I’ve been here, not one person has taken me for George Clooney.